Your morning cup of coffee will feel so much brighter with one of these pretty Celtic Crochet Coasters Patterns and we have a video tutorial to show you how. Check out the ideas now. If you can’t start your morning without a few sips of coffee or tea, then these lovely crochet Celtic Coaster Pattern Ideas will bring a smile to your dial. It’s easy to see why they have been so popular and now you can crochet along with the video tutorial. Once you learn the stitches you will be able to produce gorgeous results like those above. As mentioned, we have included a video tutorial that steps you through how to make these Celtic Crochet Coasters. You will be able to use them for dish scrubbies too once finished. 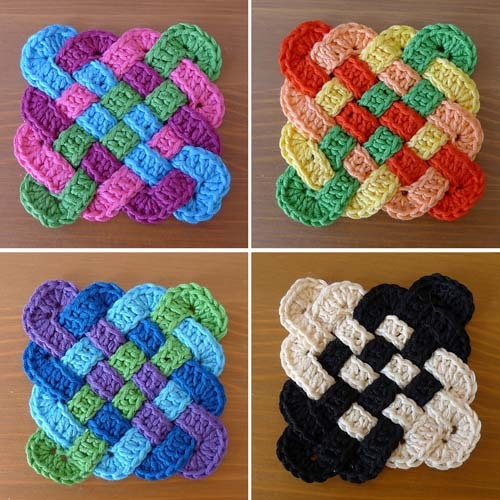 These amazing Celtic knot coasters come from Ravelry user Rainbow Junkie. They have so many different possibilities using different color combinations or one solid color. You can grab the pattern here and view the spiral scrubbies here.